Our Costco stopped selling the gigantic bag of pretzels and replaced it with a large tub of pretzels. So? Who Cares? Why does this deserve a post? If you saw how many pretzels my husband consumed in a month or week you'd understand. Looking at these plastic tubs I thought to myself..this can totally be used for something else. And then it hit me....STORAGE!! Martha always says you should use clear plastic containers for storage so that you can see what you are storing. So I've come up with many storage uses for the pretzel tub. Toys that are in rotation. Every few months I rotate the kids' toys so that they don't become bored with what they have and also to save space, we don't have the room to have every toy they own out at one time. Yarn or fabric to store in an attic or basement so that it never takes on the smells of its environments. Also seasonal clothes for the same reason. Random bits of scrap booking paper. 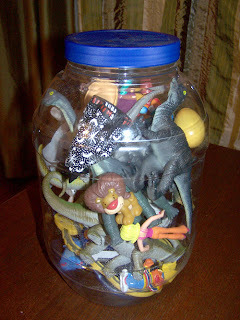 You would think by reading this blog and how often I talk about using scrap items that I am a hoarder and unorganized. I'm actually so far from that. I'm borderline OCD about organizing. And if I set up a container, like the pretzel tub, to be the holder of all scrapbook paper of a certain size (are you seeing the OCD yet?). Then once the tub is full it's time to sit down and create something from the jug. Whether it's making a ton of cards or making personal embellishments for layouts or gift tags for presents. Holiday decorations, now I can see what holiday each tub is instead of labeling a Rubbermaid box. And that's where it ends for me. So now I need your suggestions, what would you use the pretzel tub for? We are using a nut jar from Costco to save change in. We are going to use the change to buy a puppy next year provided we are living in a place that allows dogs.